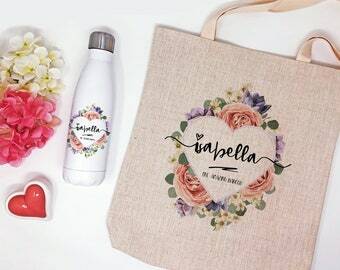 Just added this beautiful matching personalized water bottle and tote bag! To have and to hold, in case you get cold! Perfect bridesmaid gifts! Personalize it with a name or monogram. 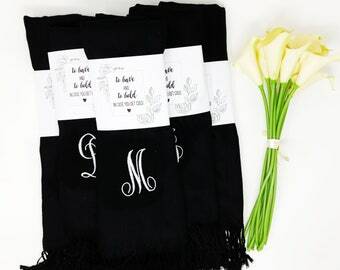 Something that bridesmaids can use at the wedding to keep warm and for years after! We love getting photos from our beautiful brides! Allyson sent this photo with her 5-star review. Thank you so much Allyson for being awesome! We are offering free shipping on most personalized items in our store this holiday season! Start your holiday shopping early! Another bride sent photos of her and her bridal party getting ready while wearing Lovingly Ours personalized floral satin bridesmaid robes. Check the listing to see additional photos from her wedding. A customer sent this photo from her wedding. So beautiful! I love how we can be part of such a memorable event with our personalized robes! 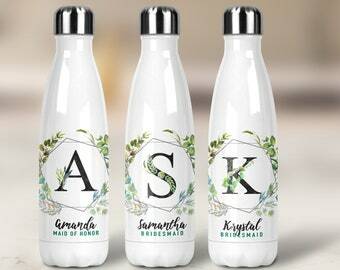 Great bridesmaid proposal gift! Check out our new thermal water bottles! Something that your bridesmaids can use during wedding preparations and at work, school or outdoor events. Teacher Appreciation Week is next week! Pls take time to say thank you to the loving teachers that invest their time and knowledge with your kids. Our embroidered waffle weave robes make for a great Mother's Day gift! Give it with a book or gift certificate to the spa! The color of the year is violet and our lavender robes will be great to use this year! Love this photo from one of our customers! Thank you to all our customers, friends and supporters! We have reached 8,000 sales! Today only, enjoy free shipping on orders over $100. Thank you! Thoughtful and affordable, matching personalized mugs are great couple gift. Fill the mugs with special treat or gift cards for extra gift surprise. February is the month of love! So we are sharing the love by giving 10% off on almost all the items in our store and free domestic shipping on purchases over $100! - That means free shipping if you purchase 4 or more bridesmaid robes or groomsmen flasks! As the 'Bomb Cyclone' slams Northeast, one of our loving customers sent this photo! She said "Nothing better than drinking hot chocolate out of awesome new mugs while dressed in cozy pajamas with a blizzard blowing outside!!!" Thank you Nikki! We love it when our customers send photos! Thank you Laura for sending! Inspired by our love for coffee, we are now offering Personalized Mugs! Check out our store for different designs! We just added Personalized Satin Robes! Thoughtful bridesmaid gifts that everyone can use after the wedding! Just added these Embroidered Personalized Toiletry/Shaving Bags to our store. Available in 3 colors/designs. Ships free! And this week only, all Men's Personalized Items are 10% OFF! Summer Sale! 10% OFF on all personalized waffle weave robes until August 15! We are now offering floral satin robes! Personalize it with a name, monogram or single initial. Use coupon "2Love" for $2 off. Just added another personalized gift to our shop! Men's Personalized Laser Engraved Lighters. Perfect gift for fathers, groom, and groomsmen! This loving bride sent this photo of her beautiful bridal party wearing their robes accompanied by a very sweet note! She said that her bridesmaids still wear their robes all the time! Beautiful photos of the bride and her bridal party wearing personalized robes by LovinglyOurs. Just received this amazing photo from one of our loving customers! I love that they have the dresses lined up behind them and how the photographer captured the moment of the beautiful bride and her bridesmaids.